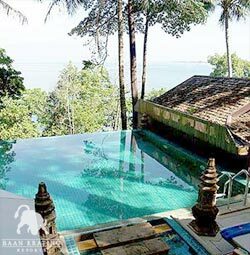 Resting on a cliff overlooking panoramic view of Khao Lak Bay, Baan Krating Khao Lak is located next to the Khao Lak Lum Rue National Park in Phang Nga Province, Thailand. The Resort has its own private rocky beach where a small jungle path connects our property to the National Parks’ sandy beach. 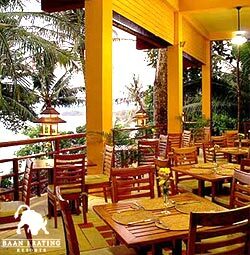 Under the shade of gigantic tropical trees and endless view of Andaman Sea, it is a perfect romantic getaway. We have created a combined seaside and mountain resort where the core characteristic of Thai hospitality with the flexibility of private home living. 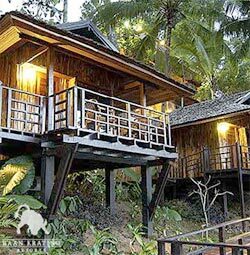 It is a wonderful place to relax and enjoy the hidden beauty of Khao Lak’s jungle beach combination. Sorny Bar & Restaurant serving Thai and Western cuisine. Poolside Bar is located on the basement of Sorny Bar & Restaurant and offers. A pool table and drinks by our cozy swimming pool. 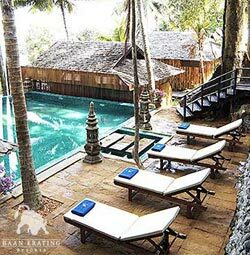 Our cozy Swimming pool has a panoramic view of Khao Lak Bay with private sun deck. Cooking school in our open kitchen at Sorny Bar & Restaurant. Bedrock private sundeck for our guests to relax by our private rock beach in the afternoon and enjoy a romantic dinning experience at night. The local attractions for Khao Lak are to explore the beauty of Southern islands including Koh Similan, Koh Kor Kao, and Koh Prathong that are located an hour away by chartered boat. 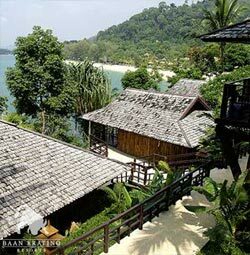 Many dive shops and excursion tour companies can arrange a private charter boat to visit various islands off Khao Lak Bay. Herbal bathroom amenities and hair dryer. Our unique out door shower. Satellite television with remote control. 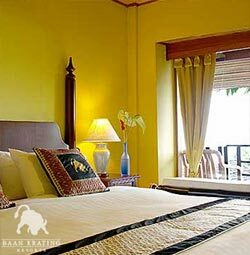 Extended balcony with panoramic view of Khao Lak Bay.